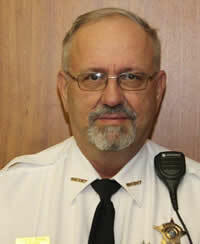 Sheriff Steve Brink became the Sheriff of Davison County in January 2013. He is a graduate of Plankinton High School and attended Northern State College. Sheriff Brink has been in law enforcement since 1995. He has been a deputy sheriff with Hutchinson County and Davison County. At Davison County he not only served as a deputy but also as Chief Deputy prior to becoming the Sheriff. Sheriff Brink is also active a member of the James Valley Drug Task Force, James Valley CISD Team, Crime Stoppers, Child Protection Board, DCI mental health board, and the member of the Local Emergency Planning Committee Board. As Sheriff of Davison County he and his deputies serve a population of over 19,000 and cover 437 square miles. Sheriff Brink also runs a 70 bed jail. In addition to housing prisoners for Davison County they also contract with seven counties to house their prisoners as well. The jail employs 30 full and part time staff. The jail also maintains an area separate from the jail to temporarily house juveniles.